The stage is set for the U SPORTS football national semifinals on Saturday, when the last four teams still standing will battle for a berth in the 54th Vanier Cup, presented by Promutuel Insurance, on Nov. 24 at TELUS-Université Laval Stadium in Quebec City. The AUS conference champion St. Francis Xavier X-Men (8-2) and the RSEQ titlist Laval Rouge et Or (10-0) kick things off at 12:30 p.m. Eastern (9:30 a.m. Pacific) in the Uteck Bowl at TELUS-UL Stadium. The Mitchell Bowl follows at 4:00 p.m. 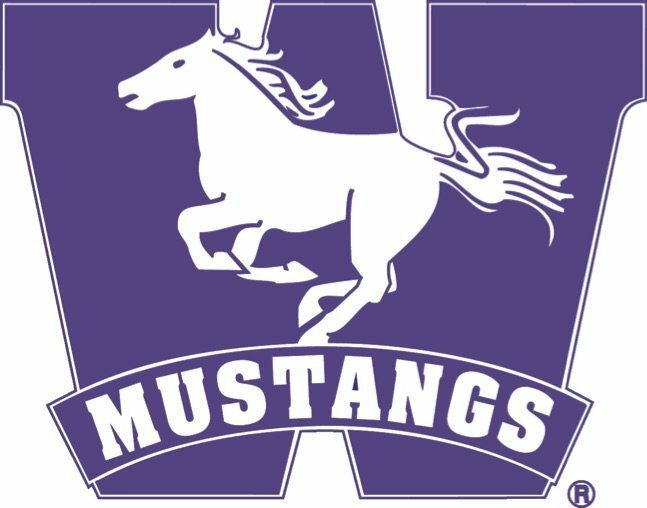 ET (1 p.m. PT), with the Canada West champion Saskatchewan Huskies (7-3) visiting the OUA monarch Western Mustangs (10-0) at TD Stadium in London, Ont. Both contests will be televised live on Sportsnet 360 and TVA Sports (Mitchell Bowl on TVA Sports 2), with coverage beginning on both networks at noon ET (9 a.m. PT) featuring a 30-minute pre-game show. The doubleheader is also available online through Sportsnet NOW and TVASports.ca. At first glance, it’s hard not to see each of Saturday’s matchups as David versus Goliath, Parts 1 and 2. 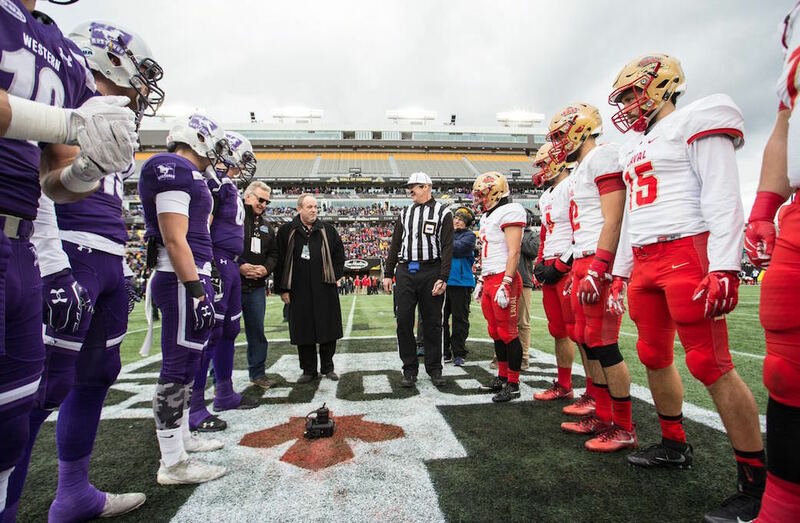 The home teams, Laval and Western, are both undefeated and met in last year’s Vanier Cup in Hamilton, where the Mustangs prevailed 39-17 to capture their seventh national title in program history and inch closer to the Rouge et Or’s record haul of nine U SPORTS football banners. The visiting squads, however, not only relish their underdog status, they both come in on a roll and playing great late-season football. StFX has won five in a row and has averaged almost 250 yards on the ground per game in two playoff outings. Saskatchewan has won four straight, the last three on the road, and pounded previously undefeated Calgary with 263 rushing yards in the Hardy Cup championship match. University football fans are well aware of the kind of challenge the X-Men face in the Uteck Bowl. The AUS conference’s recent struggles in national semifinals is well documented: a decade-long dry spell dating back to a Saint Mary’s triumph (over Laval) back in 2007, including back-to-back StFX losses in 2015 against UBC (36-9 at home) and in 2016 at Calgary (50-24). 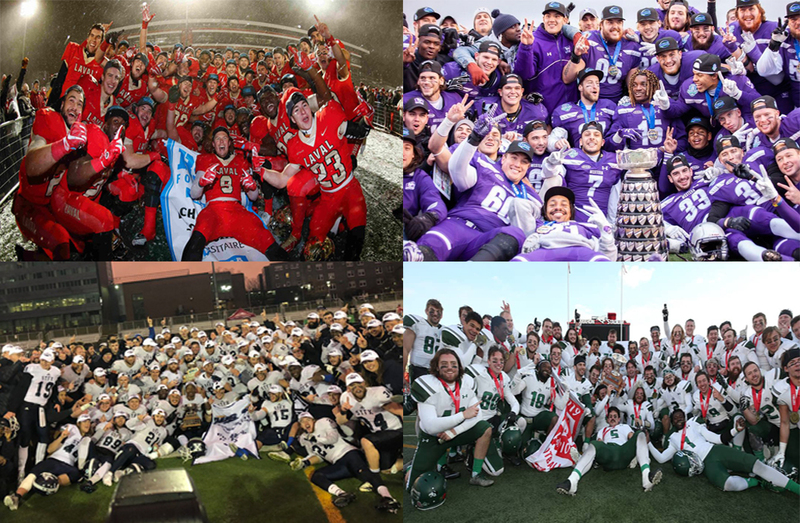 Meanwhile, the Rouge et Or are not only the most decorated program in U SPORTS football annals in only their 23rd season of existence, they are also a perfect 7-0 in Bowl games played in front of their raucous fans in Quebec City. The head-to-head history on the gridiron between the two schools also favours the RSEQ powerhouse. The Rouge et Or dominated both previous rendez-vous, each time in regular-season interlocking action, 64-0 in 2015 at Quebec City and 51-8 in 2007 at Antigonish, N.S. Over the past two-plus decades, Laval has used the old adage that defence wins championships to rack up wins and trophies at an unprecedented rate. This season has been no exception. After leading the country in conference play in fewest total yards (192.3), passing yards (123.9) and rushing yards (68.4) allowed per game and finishing second in points against (6.8 per contest), the Rouge et Or stepped it up another notch in the RSEQ playoffs, holding Sherbrooke to 55 yards of total offence in a 40-0 semifinal win and limiting Montreal to a single point on a missed field-goal attempt in a 14-1 Dunsmore Cup victory. Highlighting the stingy unit are the likes of fourth-year defensive end Mathieu Betts, a two-time J.P. Metras Trophy winner who led the nation this fall with nine sacks and 14 tackles for losses in only six league games; tackle Vincent Desjardins, second in the country with 13 tackles behind the line of scrimmage; and DB Émile Chênevert, second in the RSEQ with a team-leading four interceptions. And then there’s Adam Auclair. Left off the RSEQ all-star team this season after being named the U SPORTS defensive player of the year in 2017, the third-year linebacker got a measure of revenge in the Dunsmore Cup final, scoring the only touchdown on a 77-yard fumble recovery scoop-and-score and adding an interception en route to game-MVP honours. On the other side of the ball, the RSEQ’s highest-scoring offence (38.4 points per game - third in U SPORTS) is led by fifth-year quarterback Hugo Richard, now a three-time conference player of the year. This fall, the 2016 Vanier Cup MVP became the first player in U SPORTS history to finish his career with at least 60 touchdown passes (he actually finished with an RSEQ-record 70) and 30 rushing majors. For their part, StFX had what could be described as an up-and-down regular season before finding another gear just in time for the playoffs. Looking at the glass half-full perspective, the X-Men could easily have gone 8-0 in conference play as they held the lead in the fourth quarter in each of their two losses, both against Saint Mary’s. Looking at the glass half-empty, three of their wins came by six points or less, including a 30-24 overtime thriller against Acadia, a 33-30 decision over the same Axemen thanks to a pair of field goals in the last minute of regulation, and a 12-11 squeaker against winless Bishop’s that required another dramatic field goal by AUS all-star kicker Keiran Burnham, this one with seven seconds left in the fourth. The way his team got the job done doesn’t matter much to head coach Gary Waterman, however. In his 10th campaign at the helm, he has now led the program to three U SPORTS Bowl games in the past four years, almost half of the school’s total appearances (7) since the inception of the national semifinals back in 1967. To say StFX’s success on offence goes through its ground game would be the understatement of the year. With fifth-year senior Jordan Socholotiuk in the backfield and freshman Bailey Wasdal behind centre, the X-Men ranked fourth in the country in rushing during the regular season with 178.4 yards per game but only 23rd in passing (202.6), fourth in the five-team AUS conference. Their 254 carries ranked third in the nation, while their 213 passing attempts ranked fourth last. That disparity was never more evident than in the AUS championship match. 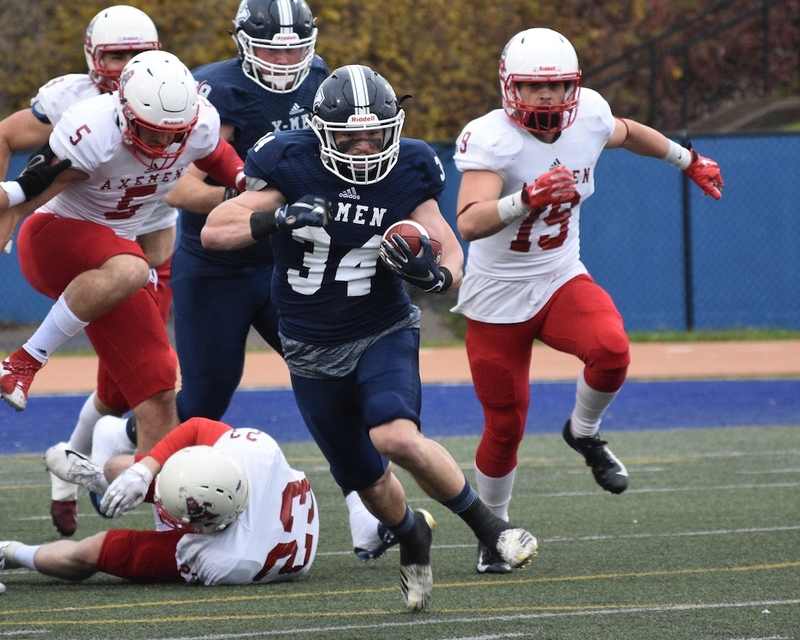 In rainy conditions last Saturday in Halifax, the X-Men ran the ball a whopping 55 times and attempted only eight passes en route to a 33-9 Loney Bowl triumph over top-seeded Saint Mary’s. After leading the nation in both rushing yards (1,009) and carries (186) in league play, Socholotiuk has been nothing short of phenomenal in the post-season with 421 yards on 58 rushes in two outings, including a game-MVP performance against Saint Mary’s, when he racked up 179 yards on 34 carries. The AUS champs are much more than a one-trick pony however. In fact, despite his remarkable achievements, conference-MVP honours eluded Socholotiuk and instead went to dual-threat standout Kaion Julien-Grant, who once again this season tormented opponents both as a receiver and punt returner. The senior led the conference in receptions (49), receiving yards (638) and TD catches (5), topped the nation in punt return yards (566), and ranked first in the AUS and second in U SPORTS in all-purpose yards (179.8 per game). Over his four seasons, the Toronto native has amassed a school-record 4,563 all-purpose yards. On defence, linebacker Gordon Whyte tied for third in the AUS with 51 tackles in eight league games, good for 10th in the country. 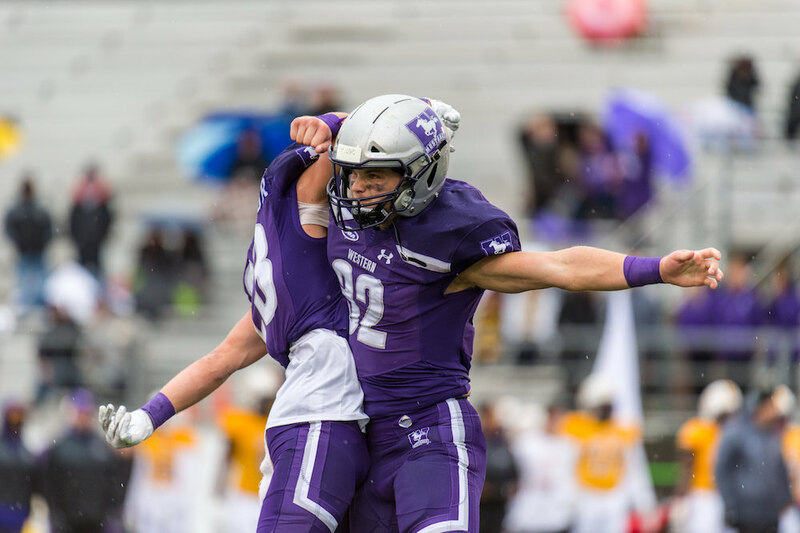 Meanwhile in the Mitchell Bowl, reigning national champion Western hopes to take one more step towards a second straight appearance in the Vanier Cup, a feat the storied program hasn’t achieved since 1994 and 1995. The Mustangs would then get a shot at hoisting the Holy Grail of Canadian university football for the second consecutive year, an exploit they have accomplished only once in the past, back in 1976 and 1977. Standing in their way is a resurging Saskatchewan team returning to the national stage for the first time since 2006, a year after missing the playoffs for the first time since 2001. In fact, the Huskies’ 31-28 overtime thriller against UBC two weeks ago in the Canada West semifinals marked their first post-season win, period, since 2009. Saturday’s tilt will mark the fifth official installment of this inter-conference rivalry, and the first one since a 33-17 Saskatchewan home win in the 1998 Churchill Bowl. All three previous battles resulted in Western victories, including in the 1994 and 1989 Vanier Cup finals at Toronto (50-40 in OT / 35-10) and in the 1974 Central Bowl in London (41-17). More recently, the two teams squared off in preseason action at Saskatoon in 2010, with the Huskies taking that one 40-12. 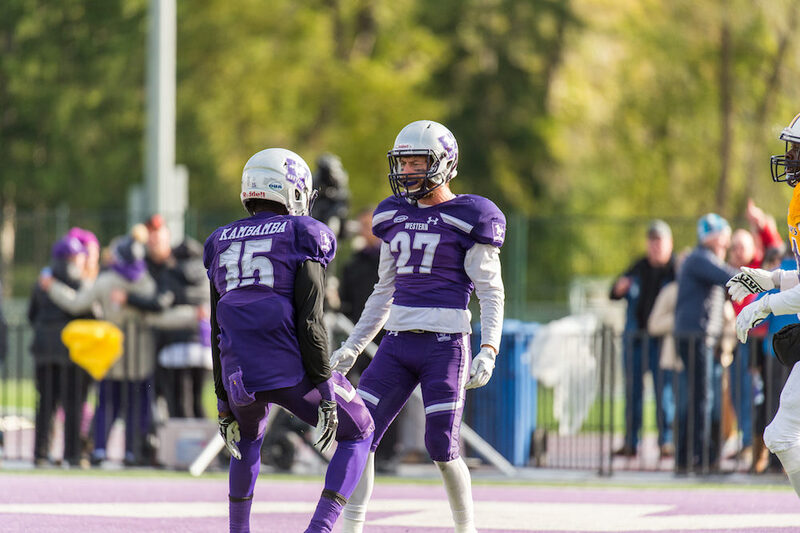 Riding a 22-game win streak overall into the confrontation – three shy of Laval’s U SPORTS record – Western has shown no signs of a championship hangover in 2018. As a matter of fact, the OUA powerhouse has posted statistics quite similar to last season in most major categories. In addition to leading the country in scoring for the fourth year in a row (48.0 points per game) and being the nation’s top rushing team for the second consecutive campaign (274.6 yards per game), the Mustangs were the stingiest defensive squad in Ontario during the regular season, averaging league lows in points (11.1), total yards (279.6), passing yards (184.8) and rushing yards (94.9) allowed per contest. While they lost some key pieces on defence following their 2017 championship run, Western returned most of their main weapons on offence including, to name only a few, quarterback Chris Merchant, the reigning Vanier Cup MVP who completed a whopping 73 per cent of his passes in conference play, and running back Cedric Joseph, who had 12 rushing touchdowns to lead the nation in that category for the second straight season. In a resounding 63-14 Yates Cup win over Guelph last Saturday, both standouts scored three majors on the ground. Thanks to that effort, Joseph boosted his ridiculous tally to 17 touchdowns in his last six post-season games going back to last year’s run. Can anyone tame the mighty Mustangs? Carleton took them to overtime in their OUA opener back on Aug. 26. Queen’s let a 23-12 fourth-quarter lead slip away in a 26-23 loss on Sept. 29. No one has come close since, with Western winning its last five by an average of 38.6 points. Whether they can take down the champs or not remains to be seen. One thing is for sure, however. The Huskies are as confident as any team heading into Saturday. And with good reasons. 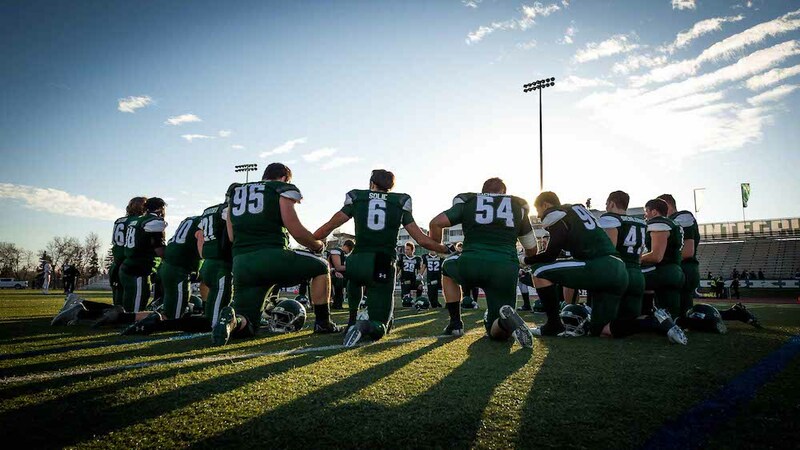 In just over a year, Saskatchewan went from missing the playoffs (2-6) under new head coach Scott Flory, to finishing third (5-3), to posting consecutive upsets over powerhouse programs in the Canada West playoffs. In their semifinal win over UBC, the Huskies scored the game-tying touchdown with 21 seconds left in regulation before prevailing in extra time. The reward was a Hardy Cup date with Calgary, an opponent whom the Green Dogs had gone 1-14 against since 2011. After racking up 31 first downs and 511 yards of offence, they were a festive bunch on the flight back to Saskatoon following a 43-18 triumph. While there have been many contributors to the Huskies’ turnaround, it’s hard not to single out running back Tyler Chow, a Calgary native who was named Hardy Cup MVP in his backyard thanks to his 222 rushing yards and two majors on 24 carries. 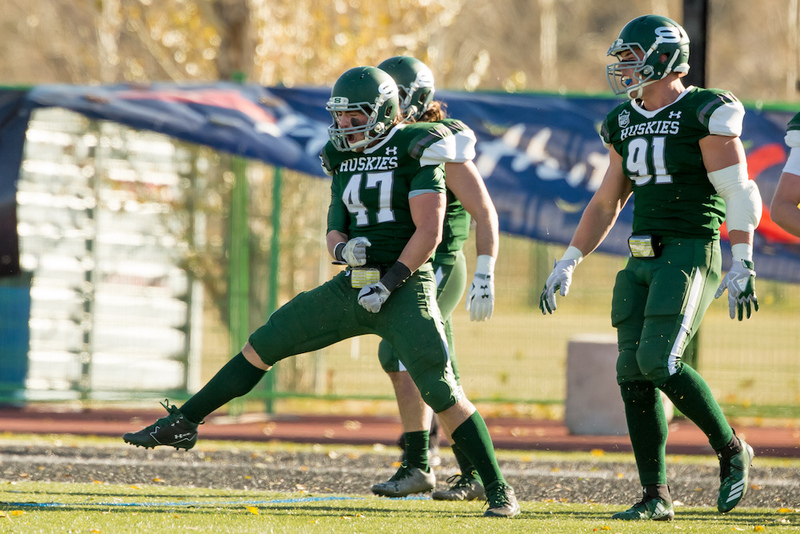 The fifth-year senior, who also reached the end zone twice in the semifinal against UBC, was voted a Canada West all-star in his final campaign after he led the conference with 640 yards on the ground. Before the Hardy Cup final, Calgary head coach Wayne Harris Jr. said Saskatchewan’s o-line “might be the biggest we face all year”. At 6-foot-3, 300 pounds, left guard Mattland Riley – the only member of the group to make the Canada West all-star team - definitely fits the bill. So do tackles Nicholas Summach (6-8, 330) and Noah Zerr (6-7, 325). That unit, along with Chow and quarterback Kyle Siemens – a fellow fifth-year senior – were key factors in the Huskies success. They led an offence that topped Canada West in rushing (172.0 yards per game) and ranked fifth in the country in both points (32.3) and passing yards (320.6) per contest. On defence, Saskatchewan led the conference in interceptions (10), sacks (17) and against the run (125.3 yards per game). The Huskies’ secondary was nothing short of sensational in the Hardy Cup with four picks against league MVP Adam Sinagra, who had thrown only five all season prior to the title match. Where: TELUS-UL Stadium, Quebec City, Que. Where: TD Stadium, London, Ont.